WARNING: Reading this blog has caused people to spontaneously Fire Up Their Lives! Hi, I’m Andrew W. Dix (Andy please) and Indianapolis, Indiana is my home. I have a variety of interests so you might see me doing a bunch of different stuff: consultant, change manager, executive coach, author, motivational speaker, teacher, trainer, private pilot, Cessna Cardinal owner, recumbent bike rider, voracious reader, happy husband, father of two daughters. I pretty much lived and then wrote a book called, “Life Matches: Fire Up Your Life!” It’s a Christian-based business-fiction book about a middle-aged, middle manager, who learns how to live a fired up life using his God-given strengths. Tom Rath’s “StrengthFinders 2.o and a simple book of matches help my characters live their lives Fired Up! You can find out more at www.lifematchesbook.com. All proceeds from this book are given to CHADD, a national non-profit organization that supports people with Attention Deficit Hyperactivity Disorder (AD/HD) and their families. Learn more at www.chadd.org. I’m a passionate advocate for persons with AD/HD. I do not have AD/HD, but several of my family members do manage their AD/HD daily. Together we live our normally distracted and sometimes dysfunctional but always wonderful life together. My book and blog are all my way of serving out my life’s purpose–to share the spark of living a fired up life! I would like to help you learn your personal gifts and strengths and then use them to fulfill your life’s purpose and destiny. Also, I try to help you to understand and appreciate your limited capacities and manage around them so that they are not excuses or hindrances to your becoming the full-potential you that you were born to be. If given the opportunity to spark someone’s full-potential, I’ll gladly strike the match! Feel free to comment on any of my posts. If you find any of my sparks helpful, please share the link to my blog with others. I have no financial interest in this venture. I am motivated only by a desire to share what has helped me to live a more fired up life. 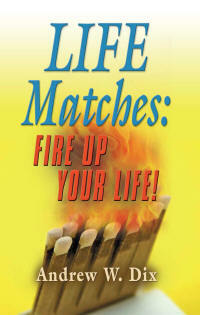 “Life Matches Live!” is my presentation that I share with groups. For an hour, I share sparks with people on how to fire up their lives and begin to live their lives on-purpose. If you would like me to teach your staff, organization or congregation how to live their lives Fired Up!, please contact me to schedule a “Life Matches Live!” session. Grab a seat on my couch and enjoy a few words. One little question that requires a really big answer, why are you here? What I mean is, what is your life’s purpose? You can contact me at andy@lifematchesbook.com.